A supply chain consists of all parties involved, directly or indirectly, in fulfilling a customer request. The supply chain not only includes the manufacturer and suppliers, but also transporters, warehouses, retailers, and customers themselves. 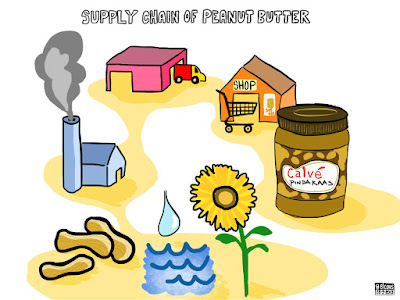 So if you want to answer of “what is supply chain?”, you should consider all those facts. Within each organisation, such as a manufacturer, the supply chain includes all functions involved in receiving and filling a customer request. These functions include, but are not limited to, new product development, marketing, operations, distribution, finance, and customer service. Consider a customer walking into a Wal-Mart store to purchase detergent. The supply chain begins with the customer and their need for detergent. The next stage of this supply chain is the Wal-Mart retails store that the customer visits. Wal-Mart stocks its shelves using inventory that may have been supplied from a finished goods warehouse that Wal-Mart managers or from a distributor using trucks supplied by a third-party. The distributor, in turn, is stocked by the manufacturer (say Proctor & Gamble [P&G] in this case). The P&G manufacturing plant receives raw material from a variety of suppliers who may themselves have been supplied by lower tier suppliers. For example, the packagingmaterial may come from Tenneco packaging while Tenneco receives raw materials to manufacture the packaging from other suppliers. A supply chain is dynamic and involves the constant flow of information, product, and funds between different stages. In our example, Wal-Mart provides the product, as well as pricing and availability information, to the customer. The customer transfers funds to Wal-Mart. Wal-Mart conveys point-of-sales data as well as replenishment orders to the warehouse or distributor, who transfers the replenishment order via trucks back to the store. Wal-Mart transfers funds to the distributor after the replenishment. The distributor also provides pricing information and sends delivery schedules to Wal-Mart. Similar information, material, and fund flows take place across the entire supply chain. In another example, when a customer purchases online from Dell Computer, the supply chain includes among others, the customer. Dell’s Web site that takes the customer’s order, the Dell assembly plant, and all of Dells suppliers and their suppliers. The website provides the customer with information regarding pricing, product variety, and product availability. Having made a product choice, the customer enters the order information and pays for the product. The customer may later return to the Web site to check the status of the order. Stages further up the supply chain use customer order information to fill the order. That process involves an additional flow of information, product, and funds between various stages of the supply chain. These examples illustrate that the customer is an integral part of supply chain. The primary purpose for the existence of any supply chain is to satisfy customer needs, in the process generating profits for itself. Supply chain activities begin with a customer order and end when a satisfied customer has paid for his or her purchase. The term supply chain conjures up images of product or supply moving from suppliers to manufacturers to distributors to retailers to customers along a chain. It is important to visualize information, funds, and product flows along both directions of this chain. The terms supply chain may also imply that only one player is involved at each stage. In reality, a manufacturer may receive material from several suppliers and then supply several distributors. Thus, most supply chains are actually networks. 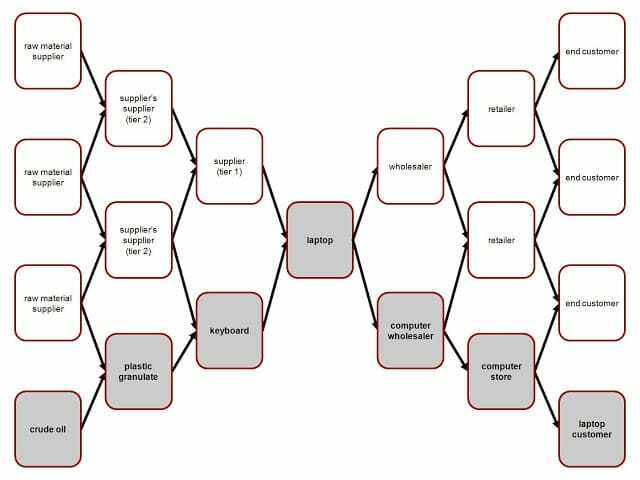 It may be more accurate to use the term supply network or supply web to describe the structure of most supply chains. Each stage need not be present in all supply chain model. 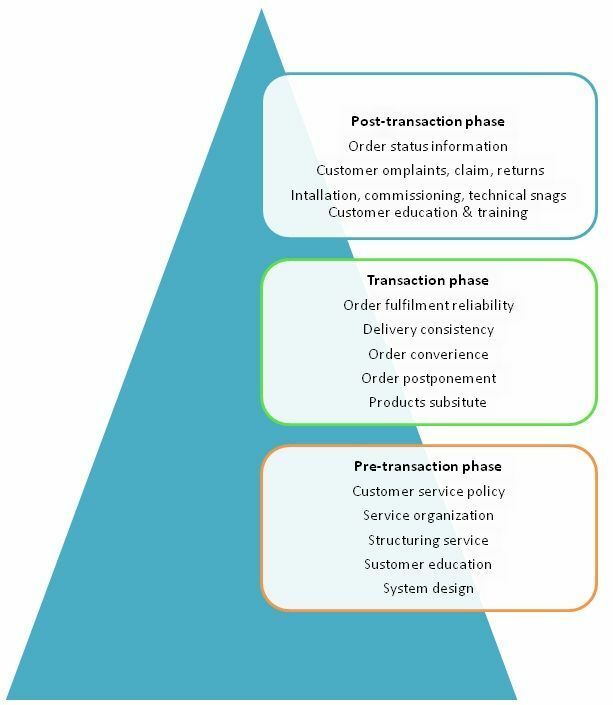 The appropriate design of the supply chain will depend on both the customer’s needs and the roles of the stages involved. In some cases, such as Dell, a manufacturer may fill customer orders directly. Dell builds-to-order: that is, a customer order initiate manufacturing at Dell. Dell does not have a retailer, wholesaler, or distributor in its supply chain. In other cases, such as the mail order company L.L. Bean, manufacturers do not respond to customer orders directly. In this case, L.L.Bean maintains an inventory of product form which they fill customer orders. Compared to the Dell supply chain, the L.L.Bean supply chain contains an extra stage (the retailer. L.LBean itself) between the customer and the manufacturer. In the case of other retail stores. The supply chain may also contain a wholesaler or distributor between the store and the manufacturer. The objective of every supply chain is to maximise the overall value generated. 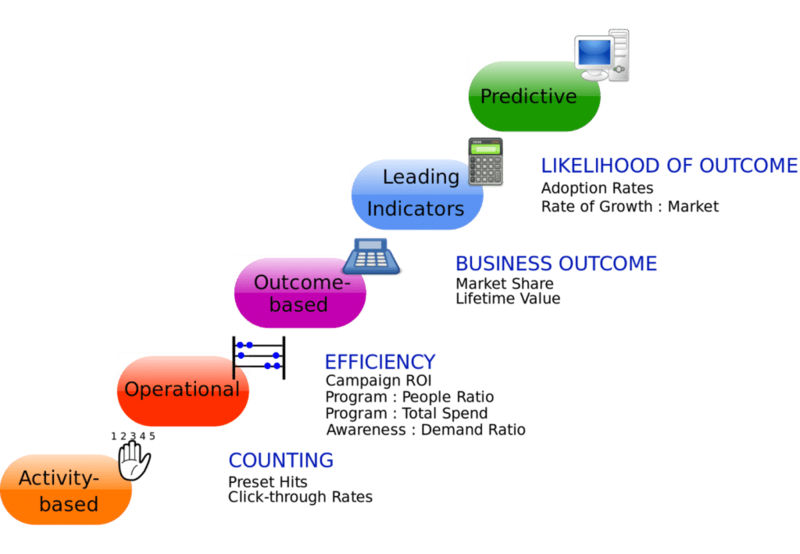 The value of a supply chain generates is the difference between what the final product is worth to the customer and the effort of the supply chain expands in filling the customer’s request.For most commercial supply chains, the value will be strongly correlated with supply chain profitability, the difference between the revenue generated from the customer and the overall cost across the supply chain. For most commercial supply chains, the value will be strongly correlated with supply chain profitability, the difference between the revenue generated from the customer and the overall cost across the supply chain. For example, a customer purchasing a computer from Dell pays $2,000, which represents the revenue the supply china receives. Dell and other stages of the supply chain incur costs to convey information, produce components, store them, transport them, transfer funds, and so on. The difference between the $2,000 that the customer paid and the sum of all costs incurred by the supply chain to produce and distribute the computer represents the supply chain profitability. Supply chain profitability is the total profit to be shared across all supply chain. Supply chain success should be measured in terms of supply chain profitability and not in terms of the profits at an individual stage. Having defined the success of a supply chain in terms of supply chain profitability, the next logical step is to look for sources of revenue and cost. For any supply chain, there is only one source of revenue: the customer. At Wal-Mart, a customer purchasing detergent is the only one providing positive cash flow for the supply chain. All other cash flows are simply fund exchanges that occur within the supply chain given that different stages have different owners. When Wal-Mart pays its supplier, it is taking a portion of the funds the customer provides and passing that money on to the supplier.All flows of information, product, or funds generate costs within the supply chain. Thus, the appropriate management of these flows is a key to supply chain success. Supply Chain Management involves the management of flows between and among stages in a supply chain to maximise total supply chain profitability. 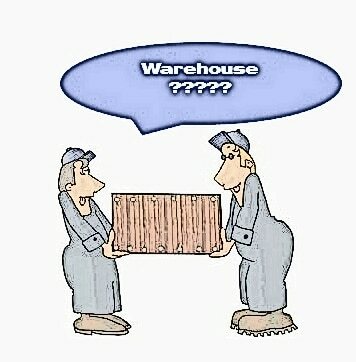 Will you ask again what is supply chain? of his website, because here every data is quality based information. hi this article gives a good knowledge about supply chain. Supply chain is a continuous process and multiple organisations are involved in it to give a better and fast services.